I was always the eccentric one back in my school days... From as early as my memory serves me, I have loved and still love esoteric, spiritual texts and reading about the great masters; Jesus, Buddha, Krishna, Mohammed, and the poems of the mystic poets; Hafiz, Gibran, Rabia, Rumi, LaoTzu, Kabir, Mirabai, Milarepa and more… In this first post in a series on Love, I’ll share a few lines of poetry from a few of my favorites; Rabia, Mirabai and Milarepa. I will add more from others in later posts. I invite you to click on the links and read about the lives and works of these dynamic, ecstatic lovers of God and poetry. You won’t be disappointed. a selfish love and a love that is worthy of Thee. to the exclusion of all others. Thou dost raise the veil that I may see Thee. But the praise is to Thee in both that and this. 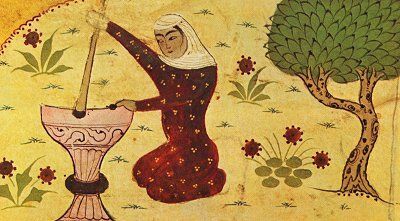 Rabia Basri was a Muslim saint and Sufi mystic who loved God with all her heart. Her powerful poems and prayers remind us of the extent to which we can open our hearts to love God and/or each other with unmitigated abandon. At the first step you body is crushed. The five purities of true nature come. Gives the order of non-grasp non-pressure. Are apart from embrace of true race. Happy is this consort, never depart. After you have departed from this earth! They offer you no shelter and no refuse! When from this world you pass away! Your empty hands take nothing with you! Your corpse will be bundled up and borne away! They will no longer be at your disposal! Your mouth will let the spittle flow! I cannot help but seek the Buddha’s Teachings! fit to serve others you will be. Jetsun Milarepa (c. 1052—c. 1135 CE) was born into a wealthy Tibetan family and when his father died, his uncle and aunt stole the family wealth. Enraged, Milarepa left to study sorcery/magic and used his knowledge to commit atrocious deeds against his uncle’s family and others before he embraced the path of renunciation and dharma. He is considered one of Tibet’s most famous yogis and poets. Positive Motivation Tip: The Mystic poets and poet saints teach us a lot about surrender, love and life in their writings. They convey their words with such fiery precision, we can’t help but pay attention. Enjoy. In one word, this is just beautiful! We have to have an open mind never forgetting our morals and education, remembering never to judge, for trying to judge is in our nature. Such lyrical poetry! I love “The Eight Reminders” by Milarepa. I’m off to read more about the author… he sounds like a very interesting person. I’m fond of LaoTzu, Jesus, Meister Eckhart, Kahlil Gibran, Hildegard of Bingen, the Bhagavad Gita and Rumi. I am always interested to read more wisdom and beauty. Thank you for introducing me to some new mystical writings by women that are quite beautiful. This is the first I’m hearing of Rabia Basri and I just love her. Thanks Elizabeth for your wonderful blog.There is so much love out there for everybody to share and live in harmony. Thanks for the follow. I know we would just have a wonderful time. I’m glad you included the female mystic poets this time. They are as gifted and as ecstatic as the men. Rabia and Mirabai are fantastic poets. While I am, as you know, an atheist, I find the words of Rabia Basri to be so very sensible. It seems to me he sums up the situation brilliantly. How many worship their god, through whatever religion, for everlasting life or 18 virgins or whatever it is that particular religion promises as the ultimate reward? Or dreads the thought of the punishments threatened? Take those away, how many people, I wonder, would continue to worship? She sounds it! I’m not nearly as widely read as you, Elizabeth. You amaze me with your knowledge of such writings. I especially loved the Eighr Reminders, Elizabeth! thank you for sharing all of these. These mystics are wonderful! Oh, Elizabeth, you are love! Thanks for sharing these. I wish I loved and lived as fiercely as they. Milarepa, Rabia and Mirabai are three new mystics you have put on my path Eliz. Thank you! We grew up listening to Mira Bhajans! Great post! I am so pleased you introduce me more to Rabi today. I have been getting a lot of inspirational tweets quoting Rumi in the past weeks. I am now so pleased to add Rabi to my search keys! I have always been fascinated by the Sufi mystics. Wonderful artwork, very spiritual, you share here, as well.